The newest number of Akita Shoten Champion RED has come to the hands of a some people in Japan, and the pictures have started to be presented. While it isn´t 100% sure if this image is true or not, most likely it is since the public release will be tomorrow (December 19 in Japan). For what it can be shown it seems that this Anime is one of the three Saint Seiya projects that Toei revealed to be working on. Making this the traditional animation one and most probably the Net Anime that will be transmited similar as how Saint Seiya -Soul of Gold- was, ergo via Streaming in Daisuki and other similar services. Acording to what it is presented in the image, not release date, staff, voice actors or anything else has been presented; but it is just a matter of time to be revealed, so nothing out of the ordinary. Now in the image itself one can see that the artstyle is a some form of mix up from the art of the manga (made by Chimaki Kuori) and with what it is the “Clasic Saint Seiya art style” alongside the coloring that remember us a little of the Araki productions works regarding the Pachinko movies of Saint Seiya. Which if that is true then that means at the very least a good visual quality is secured. As one can see they are somewhat diferent regarding the helmet. This point is interesting because Toei always have preffered their original design of the Pegasus armor instead of the manga one, thing that can be seen not only thanks to the classic anime and the video games (the Soldier Souls is quite good BTW); but also in Saint Seiya Omega where in retrospective parts one can see Seiya wearing such armor. 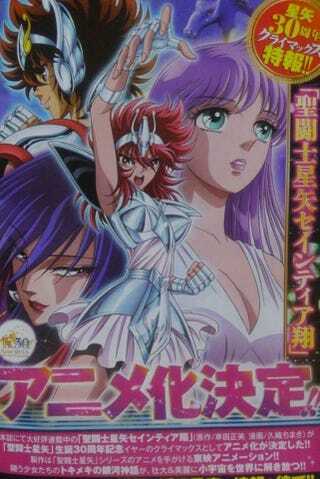 This also makes one think about the story since one of the problems that Saintia Sho had is that it follows the story of the manga very closely, and with great detail to the happenings of the story; and the Anime of Saint Seiya has a somewhat different story to the manga in various aspects, so maybe, just maybe, Saintia Sho´s Anime will follow more the story of the manga rather than the anime one, which would be a new thing since both Saint Seiya Omega and Soul of Gold are spinoffs of the anime of saint seiya rather than the manga and by that it follows the story of the animation and not of the printed material. In any case the thing looks interesting. In the decade of 1980 a Martial Arts Tournament sponsored by the Graad Fundation called “The Galaxian Wars” is just a mere days to happen in Japan. At the same time Shoko, a girl who besides being a Martial Arts practicioner, is a normal girl; one day it comes to her knowledge that a rich girl called Saori Kido will go to her school in order to present some exams to end her studies. What caught the attention of the young girl is that this Saori is the heir of the Graad foundation, who besides being the sponsors of the Galaxian Wars tournament, they are the people who gave Kyoko, Shoko´s sister, a scholarship to study abroad. Curious by her Sisters well being, Shoko tries to talk to Saori; but she gets interrupted by one of the rich girl´s bodyguard. The technique used by that person was one she never knew, one where such girl extended a weird and menacing aura surounding her. Later Shoko is interrupted by a weird girl who calls her “Mother” and “Eris resurection” and tries to take her. Suddenly she is rescued by a weird girl using a weird armor. That girl was her Sister Kyoko! This short reunion enters her to a world filled with Gods and the warrior who fought alongside them, the Saints, and the sudden taken of Kyoko by Eris forces will force Shoko to enter in this holy war! Her galactic myth starts now!